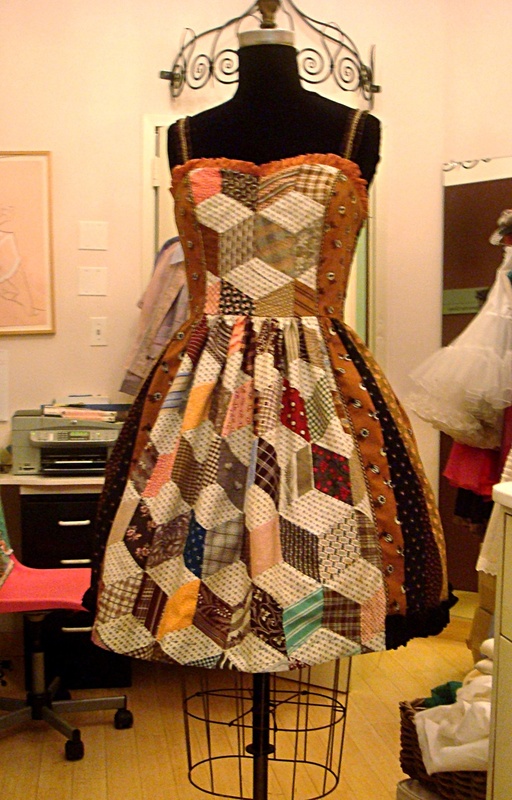 When I saw the Mary Adams quilt dress (below) I knew I had to make my own. I've been obsessed with her book The Party Dress Book, she has so many different ideas for dressmaking, including an entire chapter on piecing. So I bought a fat quarter bundles on etsy, I'm in love with the April showers print from Moda. I also got a flying geese ruler which is just a triangle with different sizes on it, to make the pieced bodice front and skirt front. I used the smallest flying geese measurement for the bodice, It worked out that four across fit perfectly for the front piece of the princess seamed top from a Colette pattern I knew would fit me. I made the front side pieces the April shower print and the side back and back pieces in coordinating prints. The triangles are made from 9 different fabrics, and a light green seersucker background. The skirt is made from strips of the fabrics, some from the Moda collection, some I got at Fabricland to match. The strips are cut at different widths, and sewn together and attached to the other pieced part I made. The skirt "quilted" part in the front is two sizes bigger than the bodice, 2 1/2 inches, I also made them four across, and gathered the whole thing to attach to the top. The skirt was a little bit short so to hem it I made a facing from the leftover seersucker and sewed it at 1/4". This dress is fully lined to prevents all the pieces from unraveling. It is so fun to wear...I wore it to work and people stopped just to look at it! I might even make another one if I fall in love with another group of fat quarters. It was a lot of work to make, I spent a ton of time cutting and piecing, but I think it was worth it! Wow, this must have taken you ages! Your time and effort paid of though, your dress looks amazing, well done! Wow this must have taken quite some time. It looks great! This is crazy awesome. You can see your love for the project. I love that Mary Adams book too. Oh that is so CUTE! I have had a sort of back-burner idea to make a quilt dress. You and Mary are providing additional temptation. This is fabulous! I love it! Wonderful job!